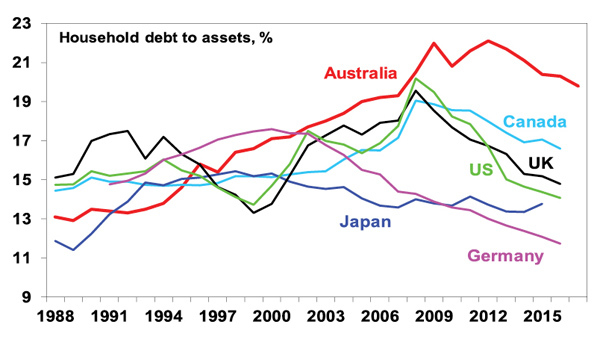 Household debt levels in Australia are high compared to other countries and still rising. 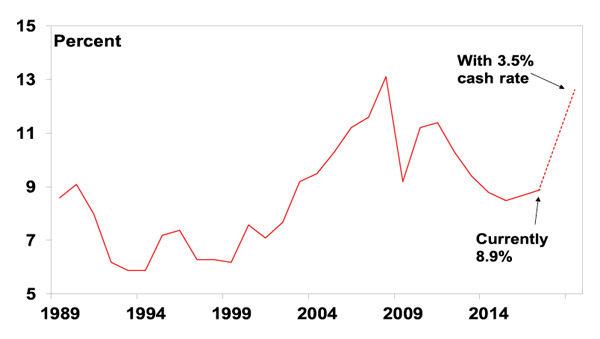 The rise is not as bad as it looks because it's been matched by rising wealth and debt servicing problems are low. However, this could change as interest rates rise and if home prices fall sharply. The trigger for major problems remains hard to see but its worth keeping an eye on. High debt levels will mean the RBA won’t need to raise rates as much as in the past to control any inflation problem that may arise. 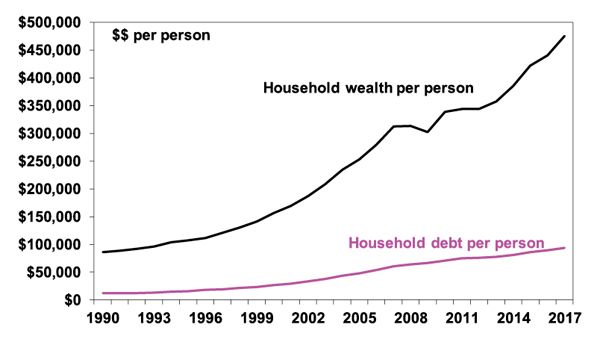 If Australia has an Achille’s heel it’s the high and still rising level of household debt that has gone hand in hand with the surge in house prices relative to incomes. 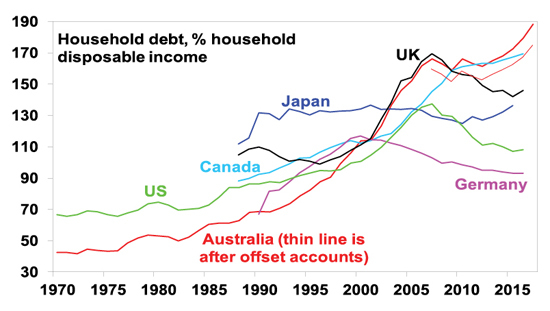 Whereas several comparable countries have seen their household debt to income ratios pull back a bit since the Global Financial Crisis (GFC), this has not been the case in Australia. Some worry Australians are unsustainably stretched, and it is only a matter of time before it blows up, bringing the economy down at the same time. Particularly now that global interest rates are starting to rise. This note looks at the main issues. The chart below shows the level of household debt (mortgage, credit card and personal debt) relative to annual household disposable income for major countries. 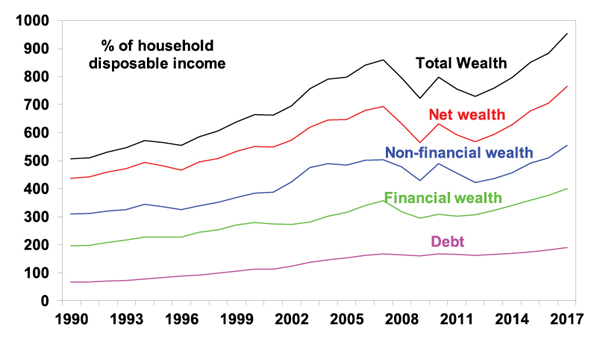 None of this is to say the rise in household debt is without risk. 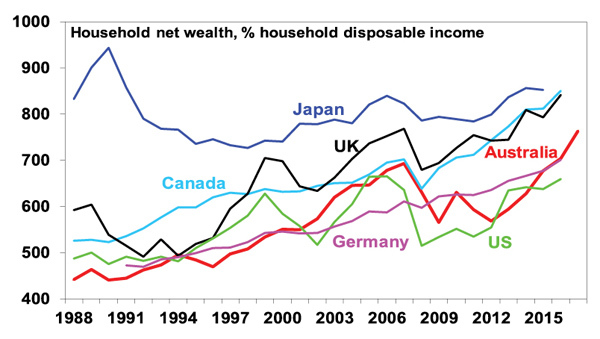 Not only has household debt relative to income in Australia risen to the top end of comparable countries but so too has the level of gearing (ie the ratio of debt to wealth or assets). – high debt levels add to the risk that if the economy falls into recession, rising unemployment will create debt-servicing problems. However, it is hard to see unemployment rising sharply anytime soon. – high debt levels could become a problem if the global and local economies slip into deflation. Falling prices increase the real value of debt, which could cause debtors to cut back spending and sell assets, risking a vicious spiral. However, the risk of deflation has been receding. – by undermining the collateral for much household debt – could cause severe damage. Fortunately, it is hard to see the trigger for a major collapse in house prices, ie, much higher interest rates or unemployment. And full recourse loans provide a disincentive to just walk away from the home and mortgage unlike in parts of the US during the GFC. – households could take fright at their high debt levels (maybe after a bout of weakness in home prices or when rates start to rise) and seek to cut them by cutting their spending. Of course, if lots of people do this at the same time it will just result in slower economic growth. At present the risk is low but it's worth keeping an eye on with Sydney and Melbourne property prices now falling. But high household debt levels are likely to be a constraint on consumer spending.